Help CentreUsing SuperControl Using the guest loginHow do I upload a document in the guest login? 1. Go to Admin > Guest Login. 3. Enter a Title for the document and then click Choose File. 4. 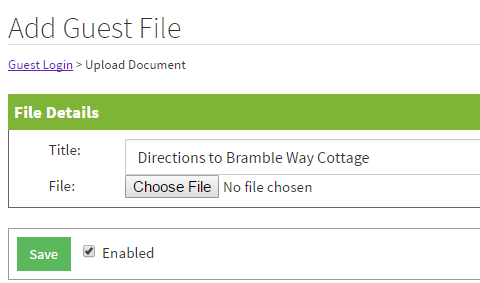 Navigate to the file you wish to upload from your computer and click Open. 5. Tick "Enabled" to set the document live within the guest login and then Save. Prev: How do I add a page to the guest login? Next: How do I amend the home-screen text in the guest login?